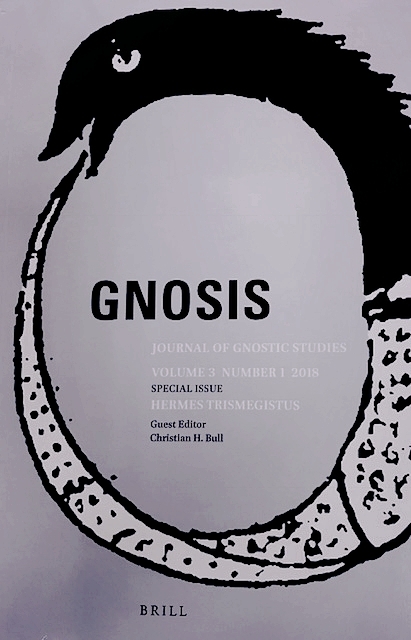 I am happy to announce that the special issue of GNOSIS 3.1 is published. Christian Bull as a guest editor put together a special collection of papers on Hermes Trismegistus. I am particularly delighted with this special collection because I have felt for a very long time that the hermetic sources often don't get the attention that they should in the study of gnostic movements and literatures. While this is a single contribution, it shows the wide range of impact that the hermetic materials and traditions have had from religion in the late antique world to modern America. The articles are slices of hermetism playing out in ancient alchemy, divination, the history of science, church sacramental practices, and Theosophy. These articles help us think outside the box, that hermetism is not a set of prescriptions defining a special religion or philosophy. Rather hermetism is the dynamic interplay of traditions authorized by Hermes Trismegistus fluctuating within different cultural situations and locations. Enjoy! Christian H. Bull, "Wicked Angels and the Good Demon: The Origins of Alchemy According to the Physica of Hermes"
Anna van den Kerchove, "The Notion of Truth in Some Hermetic Texts and Chaldaean Oracles"
Kevin van Bladel, "Al-Bīrūnī on Hermetic Forgery"
Claudio Moreschini, "The Interpretation of the Sacrament of the Eucharist as Palingenesis according to Foix-Candale"
Erin Prophet, "Hermetic Influences on the Evolutionary System of Helena Blavatsky’s Theosophy"